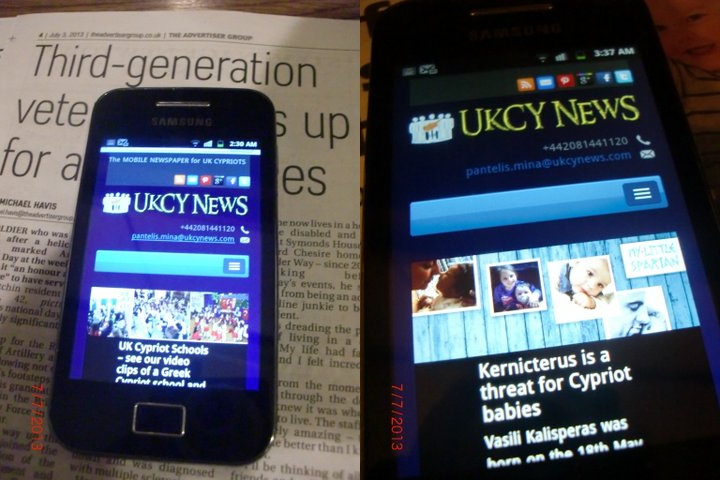 UKCY NEWS is a news and information website focusing on UK Cypriots and everyone interested in the UK Cypriot community and Cyprus. It follows the mobile/tablet revolution, which makes it ideal for reading on android mobile telephones, iphones, tablets and ipads and, therefore, deserves the description “The Mobile Newspaper for UK Cypriots”. This is the newspaper in your pocket. You can read it anywhere anytime. Statistically confirmed evidence shows that a rapidly increasing number of people in the UK and some other countries read their newspapers on their mobiles or tablets rather than in paper/printed form. Wherever you go your “mobile newspaper” will follow you in your pocket and will be much easier to handle. This is definitely the newspaper of the future (and, hopefully, you will opt for using it in the present). Another advantage, when it comes to UKCY NEWS, is that this is a newspaper for “the new UK Cypriot Community” – “the 3rd Generation Plus” UK Cypriot Community – whose best language is English rather than Greek. Whether we like it or not, it’s a fact and nothing can be achieved by just closing our eyes (or our ears in this case) and pretending that all UK Cypriots are fluent Greek speakers. We can only build on reality and this is the first issue that has to be raised and faced in the UK Cypriot community if we don’t want to lose our identity and our way completely. And that brings us to the wider aims of UKCY News – the reasons that have brought us into existence. We want to give expression and coverage to issues, news and subjects that existing community media have failed to express and cover. We respect and appreciate existing community media and their long, hard work and struggle for our community. We don’t want to be antagonistic towards them. We want to make our own contribution humbly and quietly. We want to work constructively. But we want to focus on the real lives of the real UK Cypriots. We appeal to all our friends to help us achieve these aims by simply visiting our website and trying to see if there is anything interesting or useful for them and their lives.